The new update helps exploit multithreaded AMD CPU performance. The update increases the frame rate performance of the game by 35 percent at 1080p. If you are one rocking an AMD CPU and play World of Warcraft, then there is good news for you. There is an update to the game that brings a much required boost to the performance. 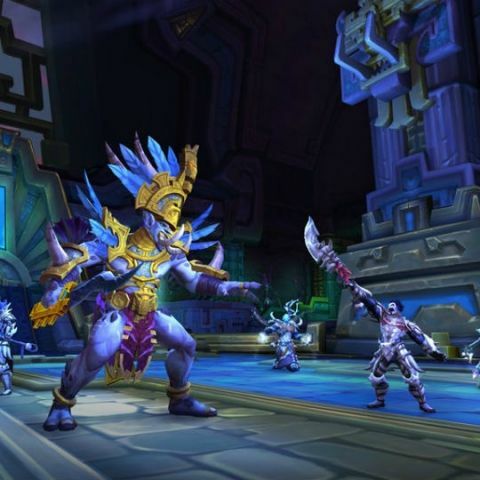 One of the bottlenecks as far as hardware goes in World of Warcraft is CPU utilisation. The game has suffered from a lack of multi threaded support. With the new 8.1 patch, Tides of Vengeance, the game sees a 35% improvement in frame rates at 1080p. Before the patch, AMD recorded an average frame rate of 43.2 fps and 42.7 fps with the Ryzen 5 2500X, Ryzen 7 2700X CPU’s respectively. These frame rates jumped to 58.1 fps, and 58.2 fps respectively after the 8.1 patch. The rig used to test the game sported 16GB of DDR4 RAM, GeForce GTX 1080 GPU, and a Samsung 850 Evo SSD. The OS of choice was of course Windows 10 x64 bit. CPU bottlenecking isn't something that's new. In the past we have seen games like the Witcher 3 which are so demanding that they face bottlenecking at a CPU level. The advancement in GPU technology has kept up with the requirements of gaming and even introduced new technologies. NVIDIA with its RTX lineup of cards have introduced Ray Tracing to bring realtime reflections to games. Currently, Battlefield V and Shadow of the Tomb Raider are the only ones that support the feature with Metro Exodus launching on 15 February being the third entry to support the tech. AMD on the other hand launched the new Radeon VII GPU to take on the RTX 2080. The performance of the cards are comparable as per global reviews but the Radeon VII lacks features like Ray Tracing and DLSS which give the NVIDIA cards an edge. Speaking of other gaming devices, the PS5 and next Xbox are expected to be announced in 2019 and expected to hit store shelves in 2020. You can read the details about the upcoming consoles here. Ps4 black screen after update! Will it get Lollipop update? Does MI3 will get ANDROID L Update?